Well, we’ve reached the midway point of summer. The days, which are (mostly) sunny and warm, stretch easily into beautiful evenings. Perfect for relaxing dinners on your deck, patio, what have you. 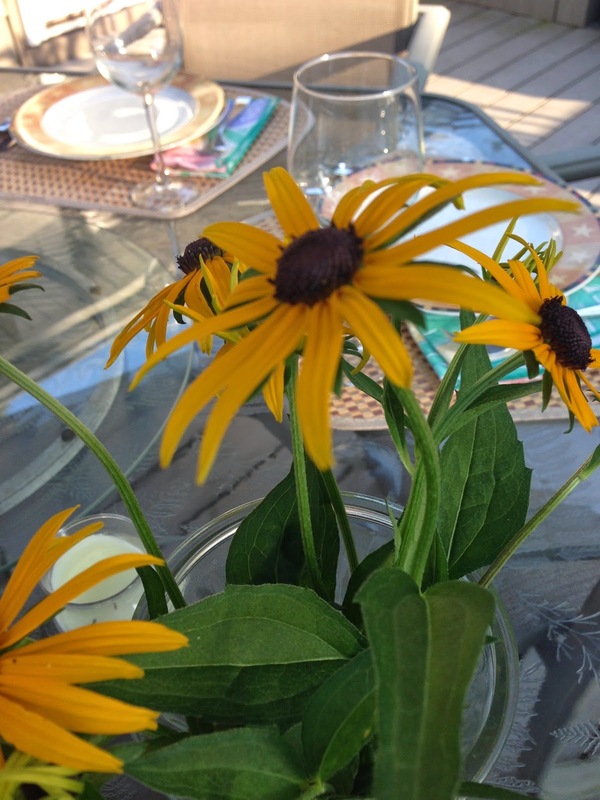 I’ve got two wonderful (and easy) recipes you should think about adding to your summer dining menus. We like to start with drinks & nibbles on the lower deck and then move upstairs for dinner. For this particular evening, we set out an assortment of fresh vegetables (cherry tomatoes, celery sticks, small carrots) with delicious hummus and baba ghanoush from a local Turkish store (these ain’t your garden variety Middle Eastern appetizers!). I add fresh pita triangles (cut from the pita breads we also buy at the Turkish store) and this time I threw in a stand of Grissini sea salt breadsticks for a little crunch. I had never tried these before but saw them when I was buying the burrata at Fairway (more to come on that later) and figured I’d give them a try. They were delicious! 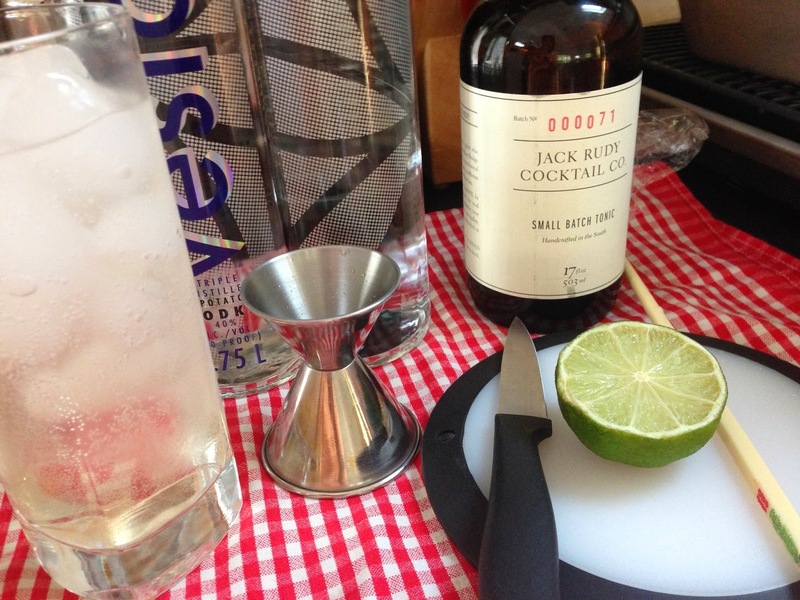 Add a refreshing vodka tonic or glass of wine and you’re all set! On to the main event. 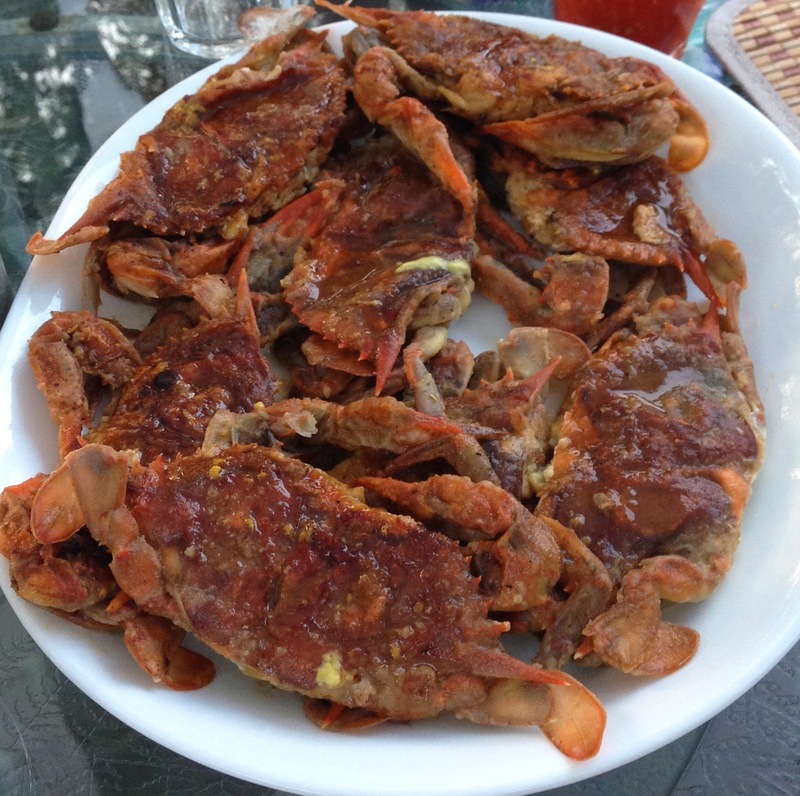 We are huge lovers of soft shell crabs and grab them whenever we can. For this dinner, we built a menu around the gorgeous crabs we got at Peter’s Fish Market in Midland Park. We began with a shot of chilled gazpacho picked up at Peter’s and while Barry was sautéing the crabs, I put together the Pickled Nectarine Salad with Burrata. I found this recipe while going through some old magazines (like from 2013!). I’m glad I didn’t just chuck this Bon Appetit issue because this recipe is a definite keeper! The mix of flavors in this salad is what really draws you in. You start with thinly sliced ripe nectarines, which you “marinate” with some red onion, white wine vinegar, and a teaspoon of sugar. 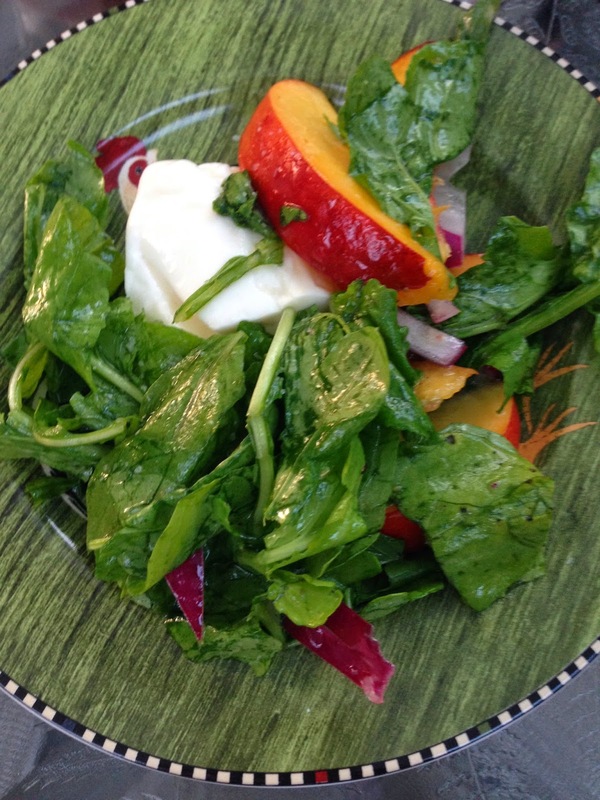 Add to this arugula, fresh mint, some extra virgin olive oil, and plate around the burrata. A sprinkle of salt, a grind of pepper, and a drizzle more olive oil, and you’ve got a salad masterpiece! If you are not familiar with burrata, it’s similar to fresh mozzarella but WAY, WAY better. Delicate and creamy, it blends beautifully with the fruit and greens. If you can’t find burrata in your local store, fresh mozzarella will do but it won’t be quite the same. As I mentioned above, I got mine at Fairway, and it was excellent. I’ve also used burrata in a genius Brussels sprout recipe from Paul Kahan and it was fabulous there, too. 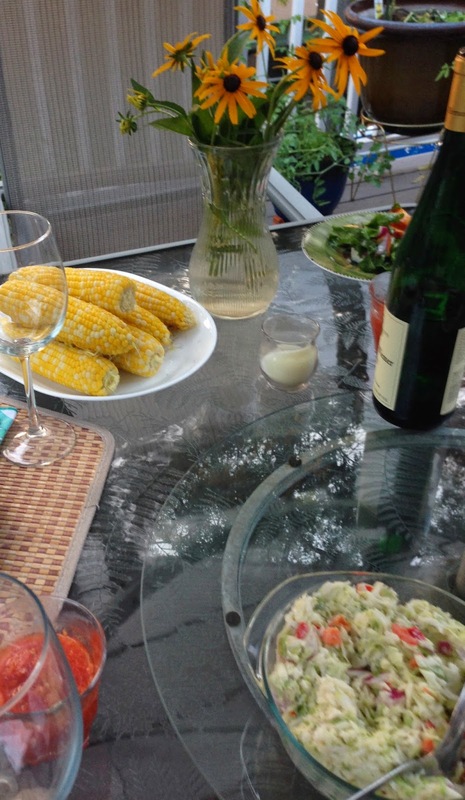 We rounded out the meal with fresh, sweet corn, cole slaw, and a perfect Herman Wiemer 2012 Riesling that we picked up on our Finger Lakes weekend last November. But, as they say in France, the piece de resistance, was dessert. Ripped from the pages of Food and Wine, we enjoyed (that’s putting it mildly!) 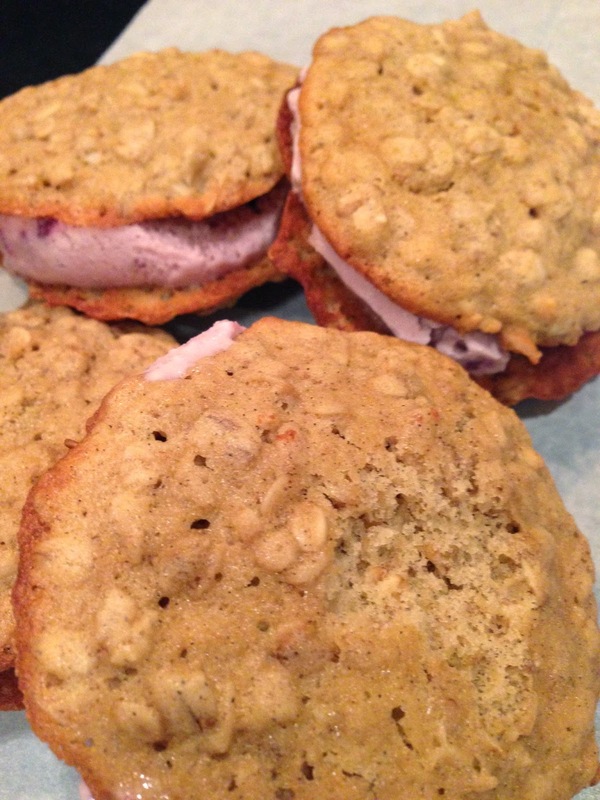 Cardamom-Oatmeal Cookie Ice Cream Sandwiches. The cookies are delicious on their own, but when you put two together to make an ice cream sandwich, well, you’ve just hit the jackpot. And I didn’t use plain old vanilla (although I adore really good vanilla ice cream), chocolate, or strawberry. No, no…I went right over the top with Haagen-Dazs Black Cherry Amaretto gelato. Oh, yeah. So there you have it, a perfect summer evening dinner. Add good friends, a pretty table setting, cool music, and this is one you’ll remember for summers to come.